You are here: Home / Food Venture / Merry Christmas and A Happy New Year..
Jingle bell Jingle bell Jingle all the way…..Sometimes Christmas songs turned out to be irritating when Christmas is approaching and everyone is celebrating but you are burdened with workload that due on 26th, 27th and 28th of December ( my girl claimed ). I know that I won’t get the chance to celebrate a merry and happy chritmas this year with a hill of assignments and lab reports. Same goes to my girl. I wished that I could have a hill valley instead of a hill so that I could throw all my work into the valley and went for my Christmas. ” Stop dreaming”, my girl would say. However we don’t want to be missed out for Christmas. So we buy some cute Christmas Snowmen and Christmas cake as consolation, every week started from the month of December. 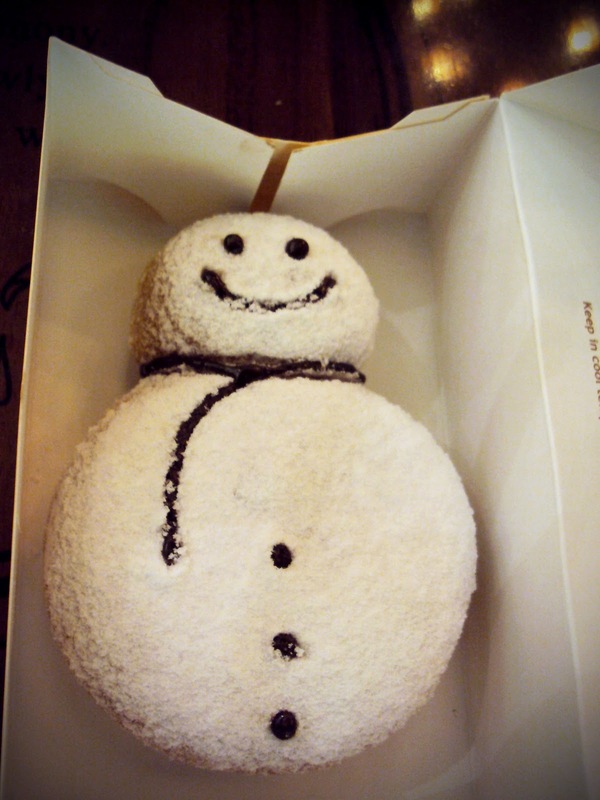 Hatty snowman from Breadtalk (RM3.00). My girl love the chocolate hat. It wasn’t a simple hat- shaped chocolate but it was christmas cake coated with chocolate. Too bad the snowman was just a empty filling bun, else I would have given the bun a high rate. 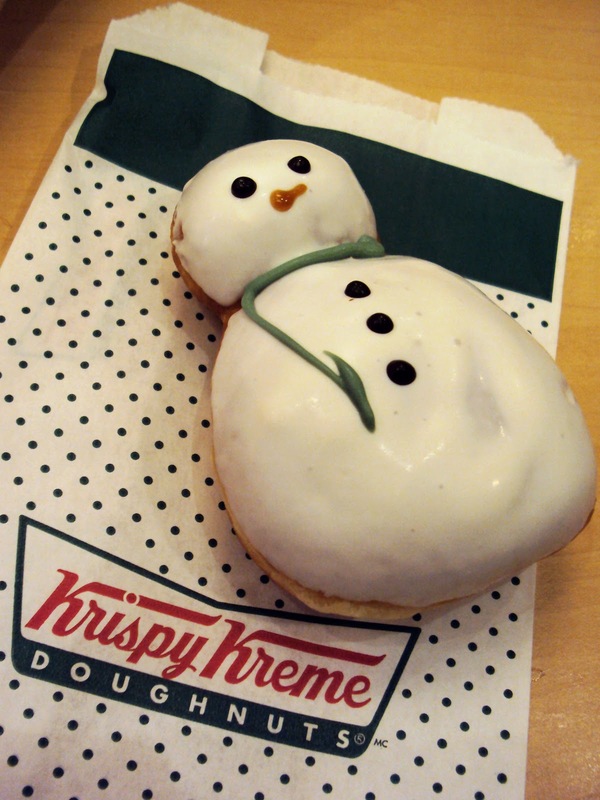 Greeny snowman from Krispy Kreme (RM2.95). Very very sweet and quite oily. Erm…it looked ugliest among all the snowmen we bought. Snowboy from J. Co Donut ( RM3.00). “Chocalate make you smile, even you are covered with snow, shivering.” : Snowboy. A very chocolaty filling and soft donut bun snowman with icing sugar coating. Snowgirl from J. Co Donut (RM3.00). My girl loved this the most. 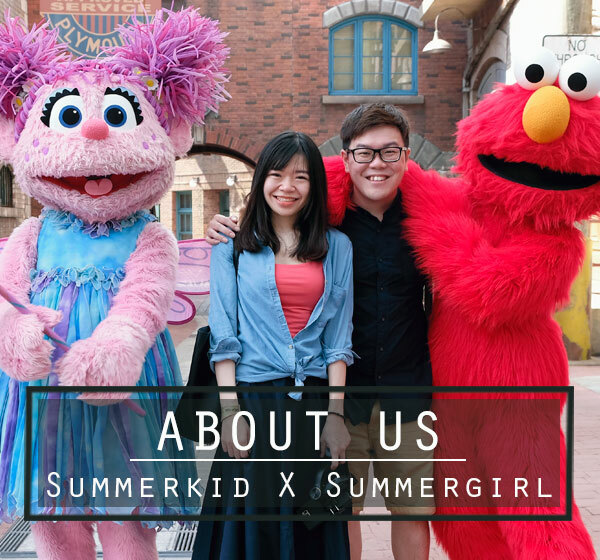 Filled with strawberry in the stomach, the snowgirl smile with full satisfaction. The donut soft bun went really really well with the strawberry jam filling and my girl kept asking me to buy her another one after finishing it. 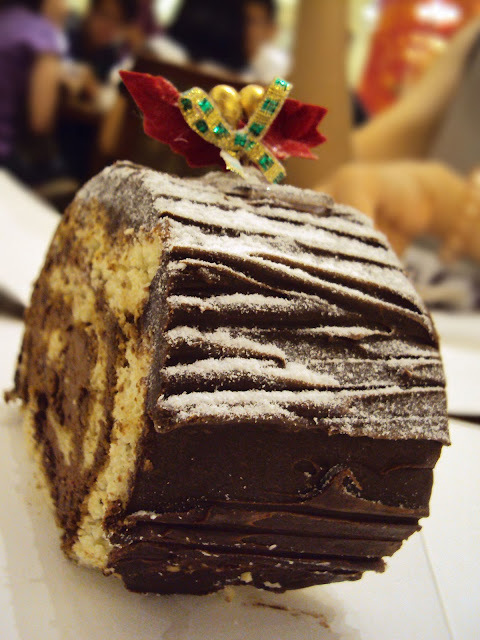 Christmas log from Coffee Bean and Tea Leaf (RM8.95). We had this on the Christmas eve. Tasted really like a log as the cake was on the dry side. However, the chocolate cheese cream was really yummy and it turn the dry log cake alive. haha..Very nice and big portion too.